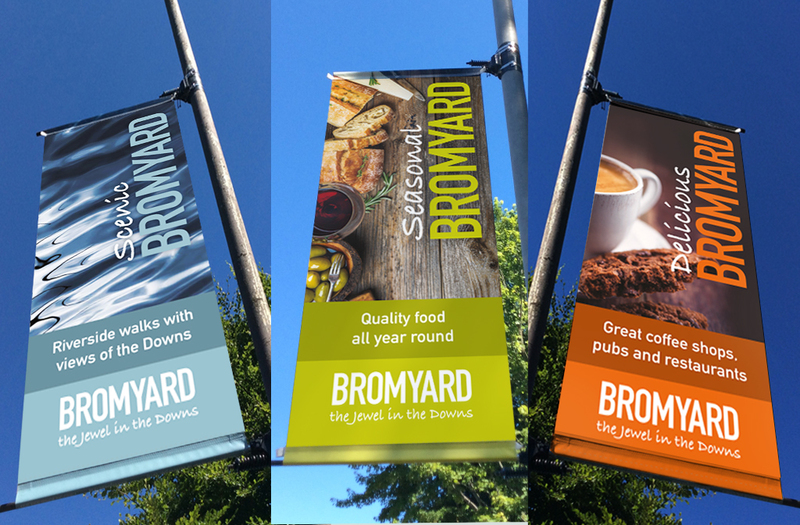 The historic market town of Bromyard, found nestling in the Bromyard downs in rural Herefordshire needed to update the lamp post banner designs along the busy tourist route from Worcester to Leominster. As a busy tourist route the town council wanted to highlight the different areas of tourism that happened in the town to attract more passers by to experience the many events, seasonal festivals and history that Bromyard has to offer. Bromyard is well known for its many festivals, from scarecrows to Town Criers, plus Jazz, Folk and The Bromyard Gala there’s a festival for all the family. These six effective and eye-catching banner designs were printed both sides on a vinyl material, then positioned along the main road to attract more passers by to stop and enjoy the seasonal festivals, musical events, food & drink as well as the scenery and historic buildings found throughout the market town.